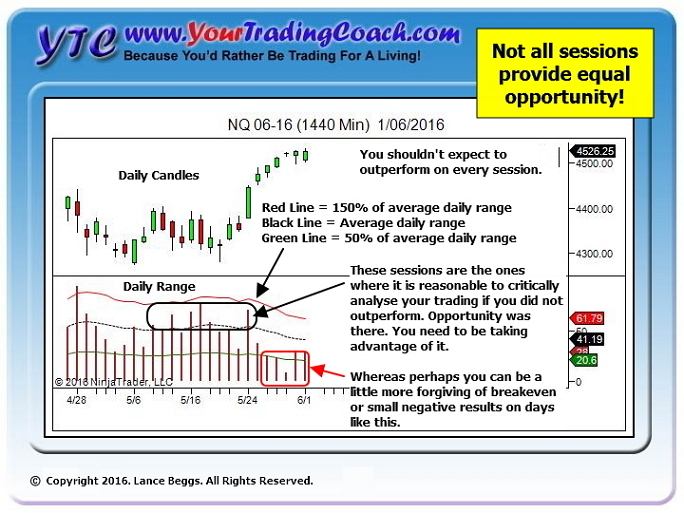 In an ideal world we would outperform in every session. But unfortunately most of us don't live in that world. There will be days when everything aligns perfectly. The market offers us perfect trading conditions. And we're actively focused and alert and able to take advantage of that opportunity. But there are also days when the market offers anything but that. The market provides trading conditions which are completely unsuited to our style of trading. And we're slow to recognise and adapt. 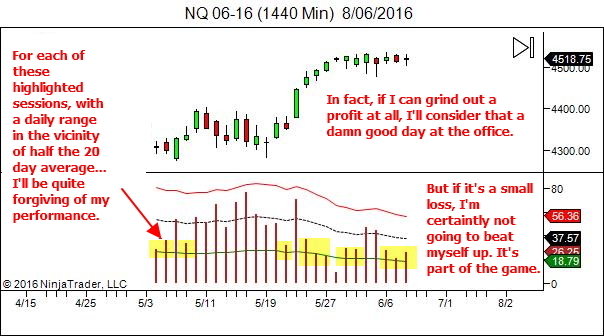 I use the daily chart with this overlay to somewhat manage my expectations. It says nothing regarding how I personally traded. And nothing regarding the "way" that price moved, whether smooth and easy or choppy and difficult. 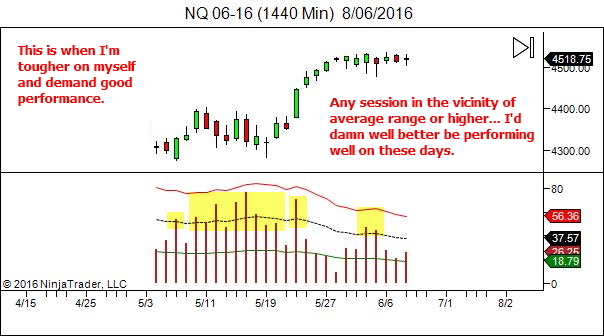 All it does is provide an indication of the daily range of movement, and where that fits with respect to the average movement over the last month. 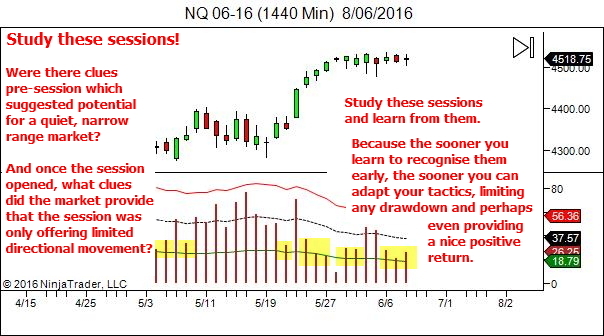 Of course, we always review the sessions and see what we can learn from it. We always seek improvement. But be gentle with yourself. 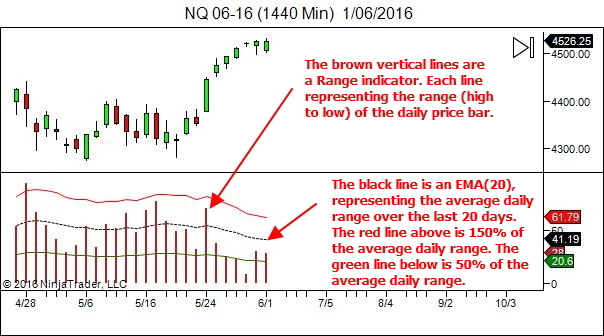 Low range days can be challenging, if you require movement to profit. If the market is not helping you out at all, don't get yourself down. You need to be motivated and focused and excited when the opening bell rings tomorrow. That's the key message in this article – be kind to yourself! A final note on this point.Some of you, with different strategies or styles of trading, may find that the opposite is the case. 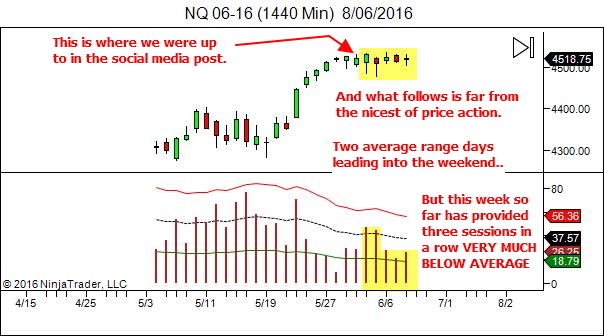 Your trading might be better suited to the quiet rangebound markets. In this case, you'll flip your expectations from what was shown above. 2. Use it to improve your ability to recognise and adapt to current conditions. 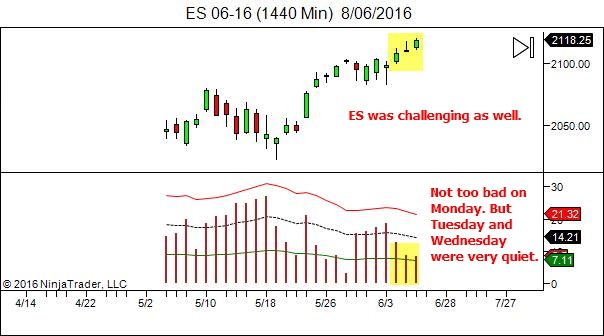 So it's a good thing if we can be a little easy on ourselves after achieving a drawdown in a narrow-range choppy sideways day. But ultimately our aim should be to learn to recognise this narrow-range choppy sideways day AS EARLY AS POSSIBLE, so that we can adapt. Perhaps through reduction of position sizes. Or being more selective with trade entries. Or adjusting our trade management style to take a greater part of the trade at closer targets. Or maybe even just standing aside until price breaks and holds beyond the current congestive chop. This allows us the best chance of keeping that drawdown to a smaller amount. Or perhaps allowing us to gain and hold a small profit instead. So how do we gain skill in quick recognition of poor conditions? 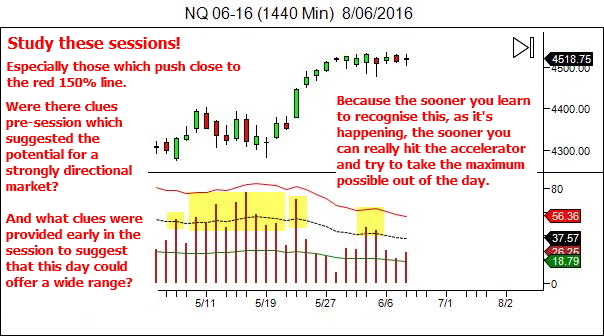 Here's where I refer you back to my old friend, the Market Structure / Price Action Journal. If you take only one thing away from this article… it's to be kinder to yourself when the market offers crappy trading conditions. I get a lot of email from traders. I see how many of you talk about yourselves. Be kind. You're a trader. You're my favourite kind of person! You're awesome! Now focus… better days are coming and you need to be ready. Thanks Harry! I’m glad you liked it. 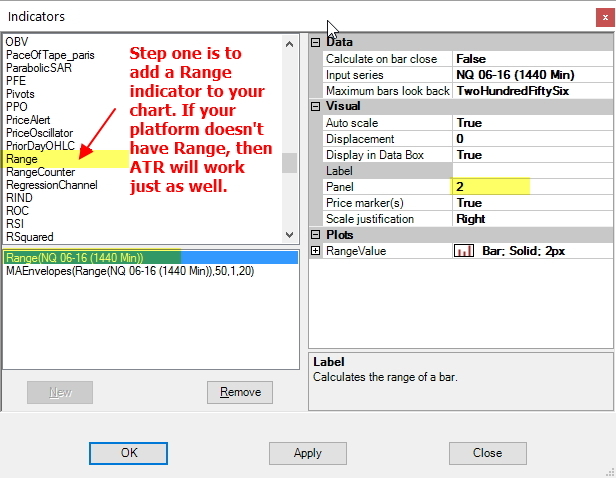 please explain how to use ATR as my charting platform doesnt give range. ATR gives only a horizontal line at the bottom of the chart. 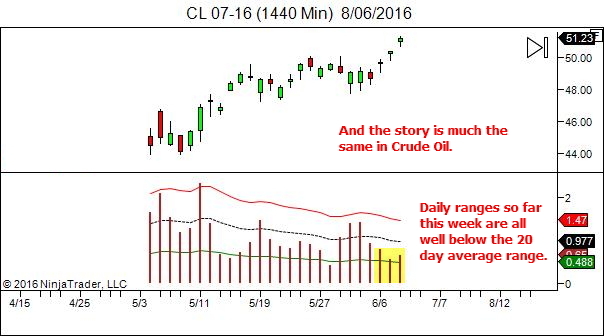 If it doesn’t allow that, you’ll need to find some other way to track the daily range. Perhaps you can program a range indicator. From a coding perspective I don’t imagine it’s hard at all (High minus low). Worst case, it’s easy enough to do manually if you can’t find an indicator solution. Just take note of the ATR(20) in your pre-session routine, along with the 50% and 150% values. 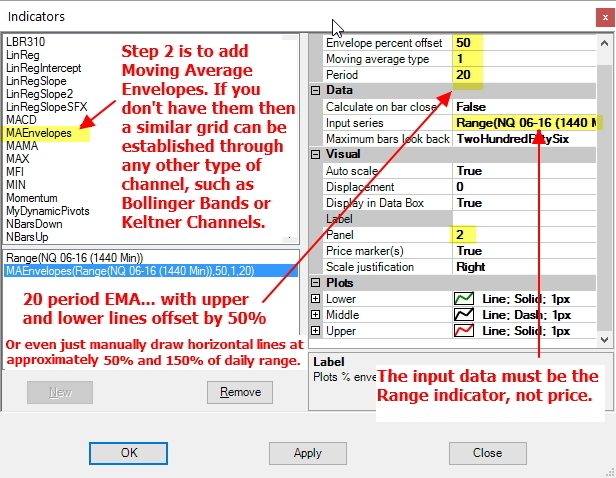 Then manually monitor the range (high to low) from time to time during the session. Thank you Lance for the detailed reply. Great article sir, as always.